Weld-On is excited to announce Green Seal Certification for 905ECO™, the industry’s first environmentally-responsible cement! WELD-ON® 905ECO™ is the first ever solvent cement certified by Green Seal™ for Environmental Innovation. Gardena, California – November 14, 2017 – Weld-On is proud to announce that the patent-pending 905ECO solvent cement has been certified by Green Seal for Environmental Innovation for effective performance, improved working conditions, and use with potable water (GreenSeal.org/GS20). The environmentally responsible 905ECO is the first solvent cement in the industry to be certified by Green Seal, a pioneering nonprofit organization promoting sustainable economy through product certification based on the Green Seal Standards. “Obtaining the Green Seal certification is further validation, this time from an independent nonprofit organization, of Weld-On’s relentless commitment to innovation, the environment and the well-being of our valued customers. The 905ECO formula has a 30% lower solvent emission rate and significantly reduced odorous fumes than the current solvent cements in the market. I am most proud that not only is the 905ECO a revolutionary, new technology with excellent performance, but it is also environmentally responsible, improving workplace conditions for the users of our products” said Fabio Castellani, President of Weld-On. 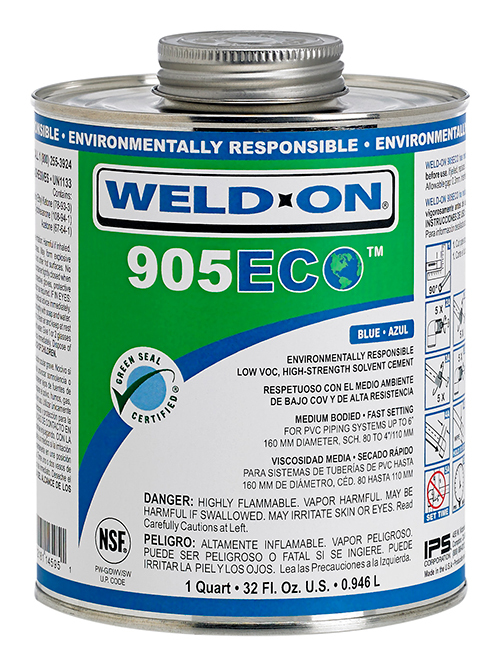 Weld-On 905ECO is a low VOC, blue, medium-bodied PVC solvent cement that can be used on PVC piping systems up to 6” diameter, Sch.80 to 4”. In addition to the Green Seal certification, it is certified by NSF International to NSF/ANSI Standard 14 and 61 and the Uniform Plumbing Code for use on potable water applications. The 905ECO is formulated to achieve strong bond strength while using less aggressive solvents. Green Seal is a nonprofit organization developing Environmental Leadership Standards that are credible, transparent, and essential to helping manufacturers, purchasers, and consumers make responsible choices. Thousands of products and services in hundreds of categories have been certified to meet Green Seal Standards.